But even the proudest ships outlive their military usefulness — and sometimes they’re barely worth the trouble to tear them down. 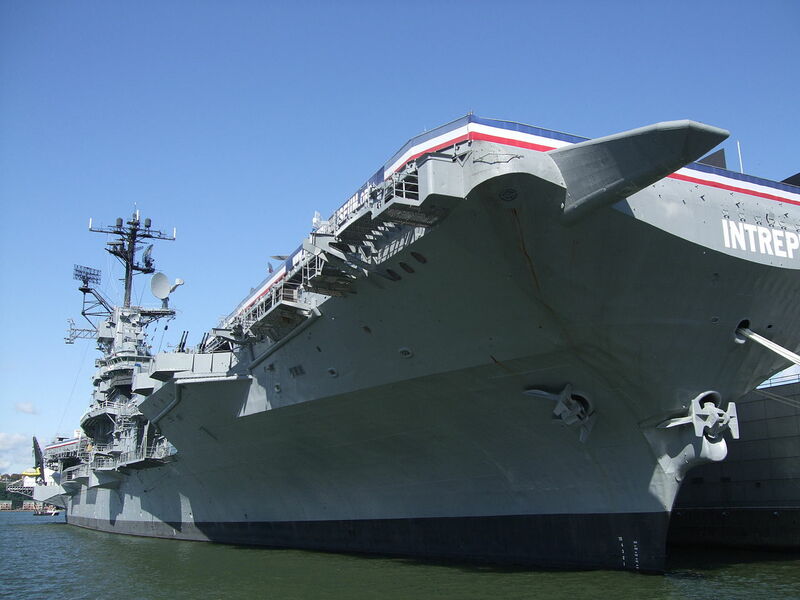 USS Constellation (CV-64) will be the latest carrier to meet the scrappers. The Navy announced in July that it plans to pay International Shipbreaking, a company in Texas, $3 million to rip the vessel apart. According to the Kitsap Sun, the sea service decided it would cost too much to turn it into a museum, and no other countries were interested in buying the 1,073-foot, 61,981-ton vessel. The “Connie” is receiving a fond send-off at ports along its journey, which Foss, the maritime company hired to drag Constellation to her last reward, is tracking through a blog. Many of her well wishers are sailors who served on the 53-year-old ship during the Vietnam War. Constellation was deployed to the Tonkin Bay and her air wing flew reconnaissance missions over Laos in the 1960s and served off Vietnam repeatedly through the early 1970s. Later in life, she helped enforce the no-fly zone over Iraq in 1995. She hasn’t sailed since being mothballed in 2003. The Navy sold USS Saratoga (CV-60) — another Vietnam-era non-nuclear carrier — in May for a single penny to ESCO Marine, which will tear it down and sell the scrap. Saratoga first set sail 58 years ago in 1955. She weighs in at 61,235 tons, according to public data from the Navy, and is 1,067 feet long. Like the Constellation, some pondered turning Saratoga into a museum. 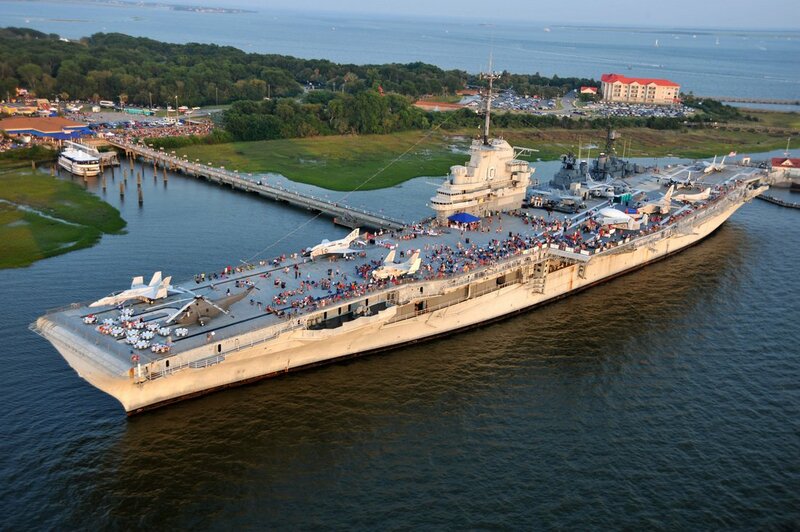 USS Saratoga Museum Foundation took a run at having its namesake preserved, but, according to the group’s final newsletter in 2010, the Navy surprised it by taking CV-60 off donation status and offering the John F. Kennedy as a potential museum instead. The Rhode Island Aviation Hall of Fame has taken up the Kennedy project and is still in the process of getting approval. Saratoga and Constellation are just the latest in a long line of decommissioned carriers, the first of which dates to the 1920s. Langley was the first of its kind. Originally built as a “collier,” or coal-hauling ship, called USS Jupiter (AC-3), it was converted to a 19,670-ton, 542-foot carrier and re-designated CV-1 in 1920. 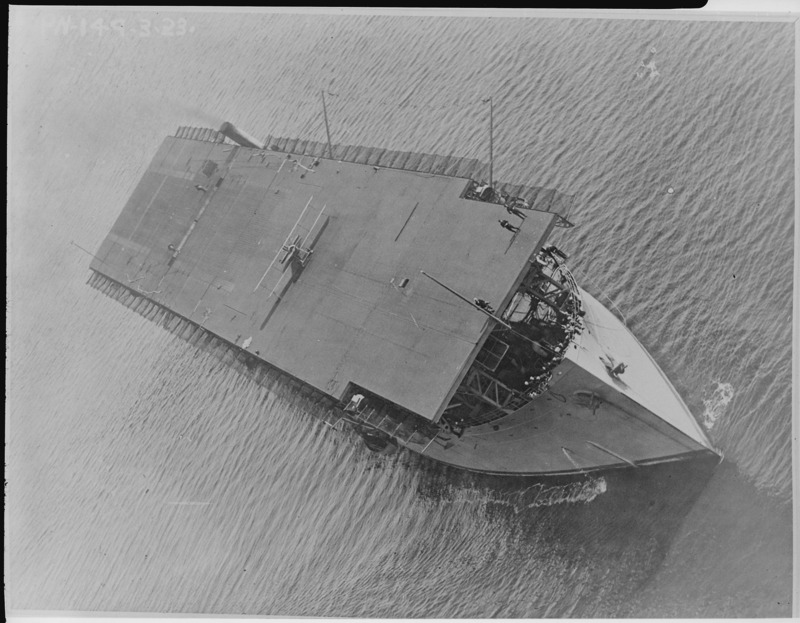 As a carrier prototype, Langley was used for various experiments with the concept of naval aviation, and in 1922 a Vought VE-7SF Bluebird biplane with flotation gear was the first aircraft launched from her deck, according to the Dictionary of American Naval Fighting Ships. She survived until 27 February 1942, when she was severely damaged by Japanese dive-bombers and subsequently scuttled. The ship also started life as a different species of vessel—a battlecruiser. The Navy switched to building her as an aircraft carrier partway through construction in 1922 and launched the vessel in 1925. At 888 feet and 37,000 tons, she was designed to carry 78 aircraft. Lexington was one of the first ships to respond to the Japanese bombing of Pearl Harbor by sending out planes to hunt for the Japanese fleet, according to an official Navy history. Six months later she was sunk by a Japanese torpedo at the Battle of Coral Sea. The elder Saratoga was the Lexington’s sister ship, also converted into an aircraft carrier from a battlecruiser in 1922. 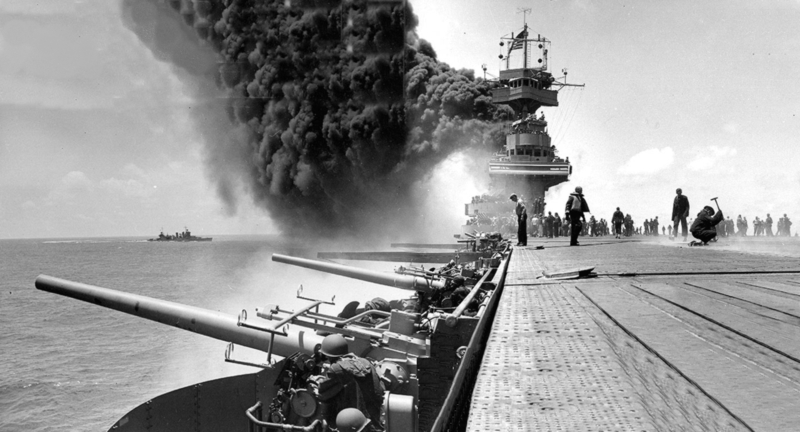 Unlike her sister, however, she survived multiple hits from the Japanese in World War II. Her fatal encounter was with the U.S. military, when she was sunk as part of atomic bomb testing in the Bikini Atoll in 1946. 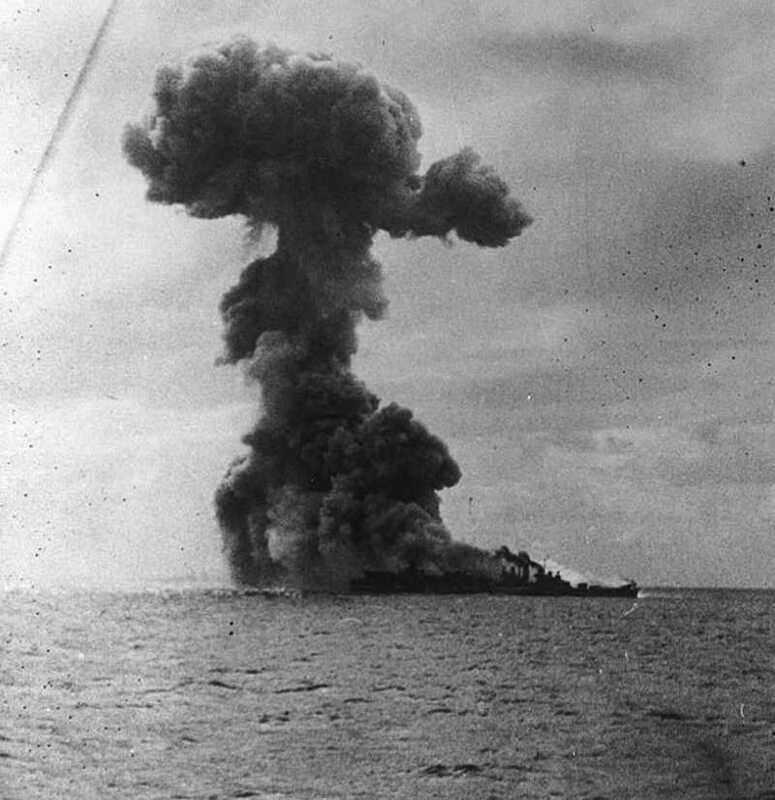 The initial “air burst” test did little damage, but a subsequent underwater bomb test did the ship in. Today she serves as an attraction for scuba divers. The ship was another of the lucky few early aircraft carriers to survive World War II. Launched in 1933, she was the first carrier built from the keel up instead of converted from another type of hull. She weighed 14,500 tons and was 769 feet long, and could carry up to 86 P-40 planes. In 1942, she helped launch the Allies’ North Africa campaign from the coast of Morocco, and later attacked German shipping vessels near Norway. For her efforts, she was sold to Sun Shipbuilding and Drydock Co. for scrap in January 1947. Yorktown was launched in 1936 with a fighting weight of 19,800 tons and length of 809 feet. Built to hold 90 aircraft. In January 1942, she fought in the Marshall-Gilberts raids, which were the first American offensive of World War II, but in June that year she was done in by Japanese torpedoes at the Battle of Midway, with a loss of 141 sailors. Enterprise was the seventh ship to bear that name, but the first carrier. Commissioned in 1938, she bore the same dimensions and aircraft capacity as the Yorktown. In 1941, her scout planes arrived at Pearl Harbor to discover the bombing in progress. Three days later her aircraft sunk a Japanese submarine. She fought in the battles of Midway and Guadalcanal, surviving both, though emerging from the latter heavily damaged. After the war she became redundant. At first slated to become a permanent memorial, those plans were shelved in 1949 for lack of funding. Instead she was sold to the Lipsett Corp. for scrap metal; her teardown was completed in 1960. Wasp (CV-7) was commissioned in 1940. Smaller than the Yorktown class, she weighed 14,700 tons and measured 741 feet, but could carry up to 100 aircraft. She joined the initial assault on Guadalcanal in August 1942 and was sunk there by the Japanese the following month. 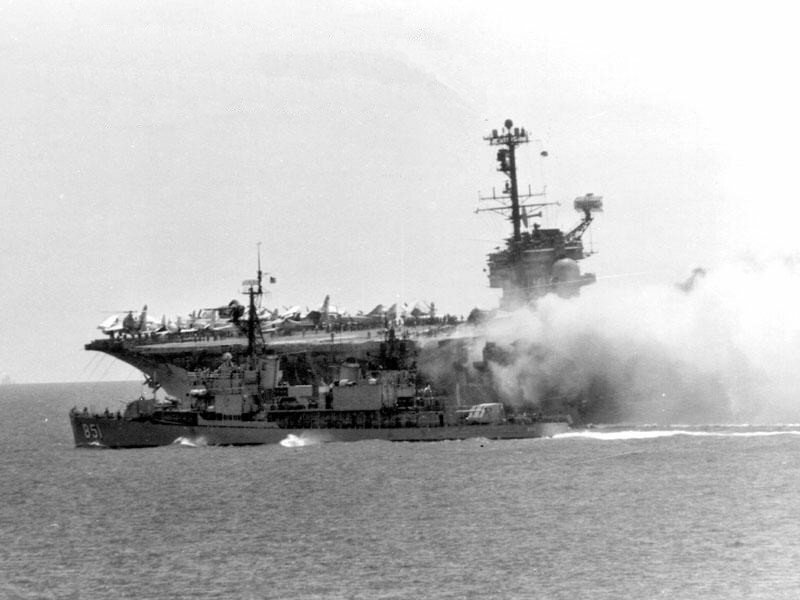 The life of Yorktown-class carrier Hornet (CV-8) was a brief one. Commissioned just two months before the attack on Pearl Harbor, her first major mission was the carrier base for the Doolittle Raidthe Battle of Midway in June 1942. That October, she was fatally wounded at the Battle of Santa Cruz and sank off the Santa Cruz Islands. 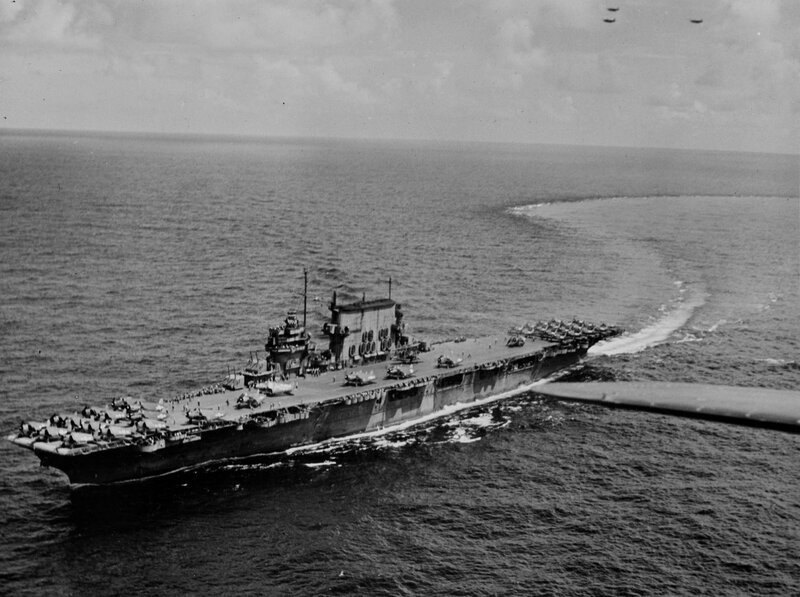 Like the other Yorktown carriers, she weighed 19,800 tons, measured 809 feet and carried up to 90 aircraft. The eponymous lead of the 24-ship Essex carrier class, was commissioned in 1942, weighing in at 27,100 tons and measuring 872 feet. Made to hold between 90 and 100 aircraft and in 1945 launched attacks on Tokyo in anticipation of a major landing on the home islands, which never occurred. After the war she was renovated and recommissioned in 1951, then transformed into a submarine warfare support carrier in 1960. In 1975, Essex was sold for scrap. Named after the deceased Yorktown—sunk at the Battle of Midway—the Yorktown was commissioned in April 1943. 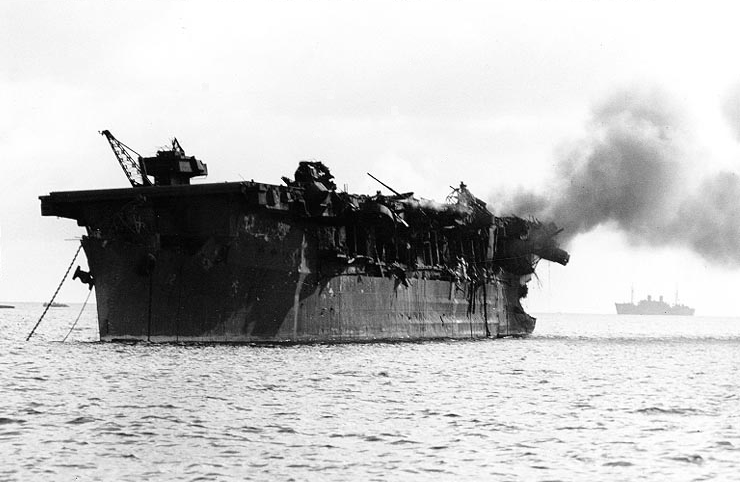 An Essex-class carrier and supported amphibious assaults on several Pacific islands held by the Japanese and participated in bombing the home islands near the end of the war. Surviving the war, she went on to participate in the Vietnam War. In 1974, the Navy donated her to Patriot’s Point Development Authority in South Carolina, which turned her into a museum. She was declared a National Historic Landmark in 1986. In 2012, the ship hosted the second annual Carrier Classic college basketball game. 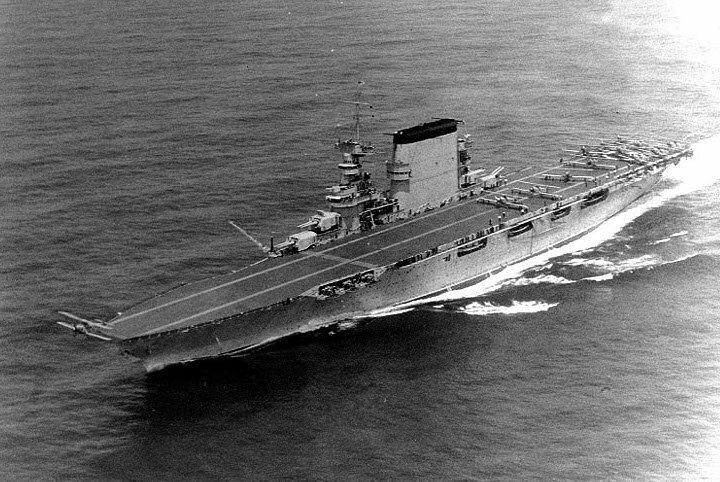 Commissioned in April 1943 as a member of the Essex line of carriers, the Intrepid. Her first campaign was the attack on the Marshall Islands in the Pacific, followed by the assault on the Philippines. In 1952, she was converted into a more modern carrier, according to the official Navy history of the ship, after which it participated in recovering astronauts from post-mission splashdowns and later fought in the Vietnam War. 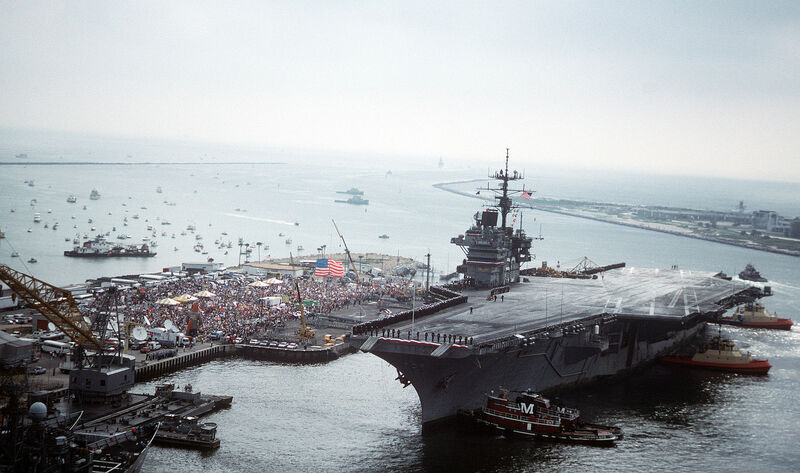 Despite initial plans that she be scrapped after her 1974 decommissioning, Intrepid was instead opened as the Intrepid Sea-Air-Space Museum in New York City in 1982. She served as an FBI operations center after the 11 September 2001 terrorist attack on the World Trade Center. USS Hornet (CV-12) practicing recovering the Apollo capsule. 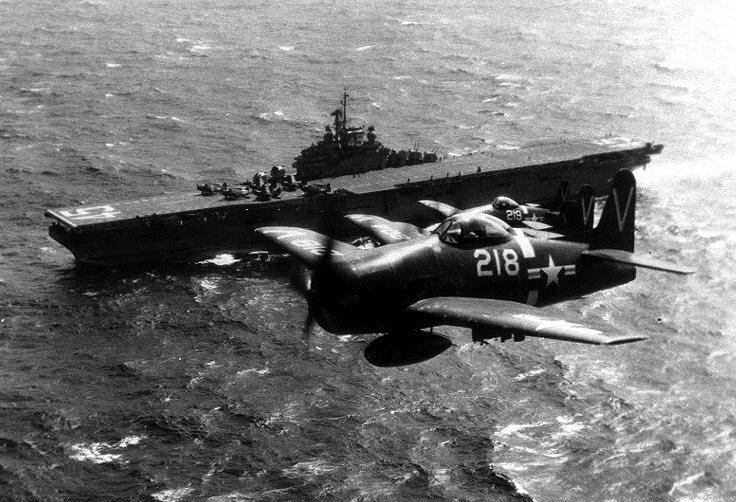 Commissioned in 1943, the Hornet was named in the earlier Hornet‘s honor when the latter was sunk by the Japanese. Like her predecessors in the Essex line of carriers. She saw action in World War II, the Korean War and Vietnam. 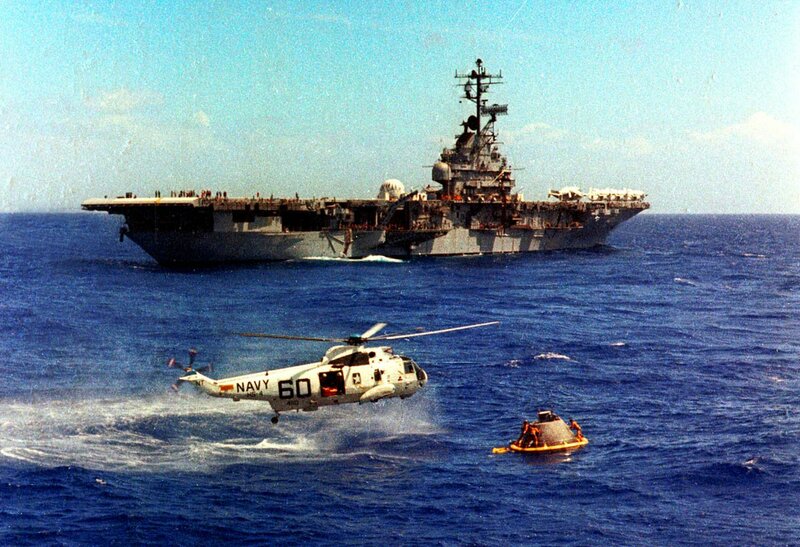 Hornet was the ship that recovered the Apollo 11 astronauts following the U.S. moon landing. The ship was mothballed in 1970. CV-12 was placed on the National Historic Landmark registry in 1991 and donated as a museum to the Aircraft Carrier Hornet Foundation in 1998. Several television episodes and films have since been shot on board, and she has received widespread media attention for alleged hauntings aboard. The Essex-class Franklin was commissioned in 1943. Steaming close to the Japanese mainland islands in 1945, she was struck by Japanese bombs and catastrophically wounded. Eight hundred sailors died in the ensuing conflagration, but the ship was saved. While technically active until 1964, she never took to the seas again after the war and in 1966 was sold to the Portsmouth Salvage Company. The ship was commissioned in 1944. The same year she participated in the campaign against the Philippines and went on to assault the Japanese home islands in the final days of the war. Two decades later she played a role in the Gulf of Tonkin incident, launching aircraft to support the USS Maddox andUSS Turner Joy against alleged attacks by the North Vietnamese. An inspection in 1973 found that she was unfit for service. Ticonderoga was subsequently decommissioned and sold for scrap in 1975. Commissioned in October 1944, Randolph (CV-15) weighed 27,100 tons, was 888 feet long and held 90 to 100 planes. She participated in attacks on the Japanese home islands late in the Second World War, then ferried troops home from Europe in Operation Magic Carpet. She was decommissioned after a relatively uneventful postwar life in 1969. In 1975, Randolph was sold to Union Minerals and Alloys for $1.5 million and torn down for scrap. The ship was commissioned in 1943, was named for the ship lost in the Battle of Coral Sea while the former was under construction. She was built to weigh 27,100 tons and was 872 feet long, carrying up to 110 aircraft. CV-16 fought off the Philippines in World War II, then was decommissioned in 1947, but resurrected as an attack carrier in 1955. From 1969 to 1991 she served as a training ship. 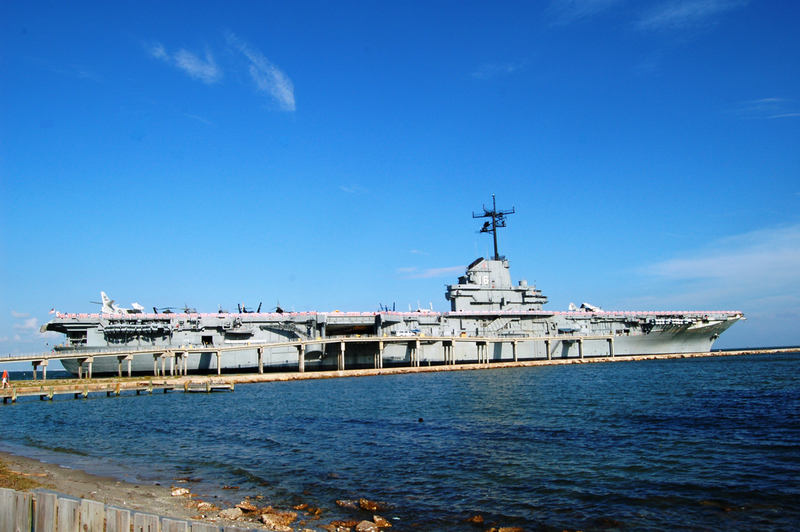 In 1992, after decommissioning, the Lexington was donated to become USS Lexington Museum on the Bay off Corpus Christi, Texas. USS Bunker Hill (CV-17) was commissioned in 1943 and designed to carry 90 to 100 aircraft. Bunker Hill fought in the Battle of Iwo Jima and carried troops home from the Pacific in Operation Magic Carpet. Decommissioned in 1947, she was in mothballs until 1966, after which she was decommissioned, but still used as a stationary electronics test platform. She was sold for scrap to the Zidell Marine Corp. in 1973. USS Wasp (CV-18) was commissioned in November 1943, weighing 27,100 tons and measuring 872 feet. Like most of the Essex class, she was designed to carry 90 to 100 aircraft. 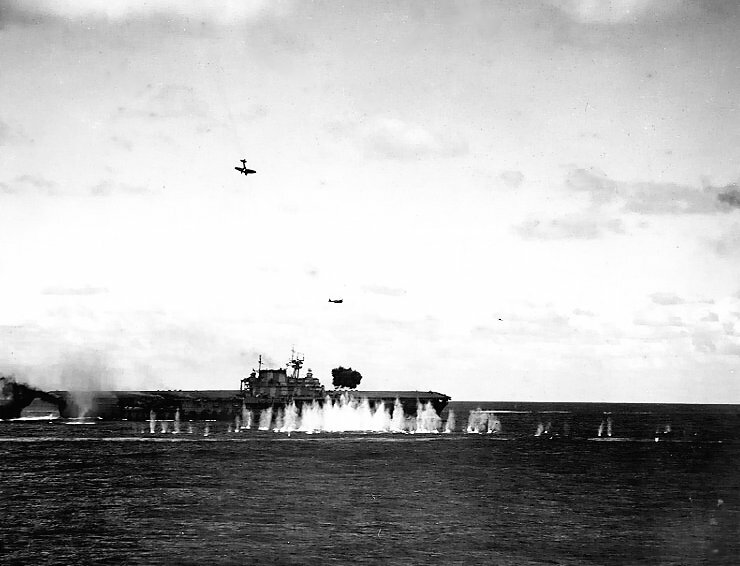 Before the end of the war, Wasp participated in Pacific island assaults and the attack on Okinawa. Wasp was decommissioned in 1972 and sold to the Union Minerals and Alloys Corp. in 1973 for scrap metal. USS Hancock (CV-19) was commissioned at the tail end of World War II in April 1944. As an Essex-class ship, she weighed 27,100 tons and measured 888 feet, carrying 90 to 100 aircraft. Though her time fighting in the Pacific in World War II was brief, she lived long enough to see the end of the Vietnam War as well. In 1976 she was decommissioned, then sold for scrap and torn down the same year. USS Bennington (CV-20) was commissioned in August 1944, weighing 27,100 tons and measuring 872 feet, and able to carry 90 to 100 planes. In 1970 she was decommissioned. In 1993, she was sold for scrap metal, then towed across the Pacific to India to be scrapped. 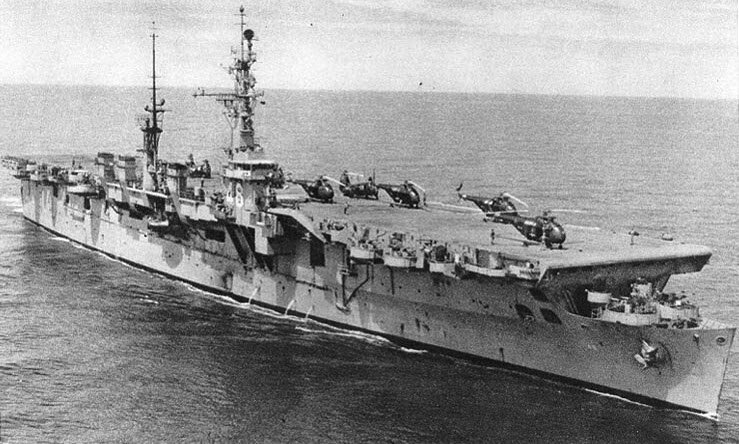 USS Boxer (CV-21) was another Essex-class carrier. Commissioned in 1944, she weighed 27,100 tons and measured 888 feet, and was able to carry up to 110 planes. In 1950 she rushed supplies to U.S. bases in Japan at the outbreak of the Korean war. In 1969 she was decommissioned, and then sold for scrap in 1971 and torn down at the Brooklyn Navy Yard. USS Independence (CVL-22) afire aft, soon after the “Able Day” atomic bomb air burst test at Bikini on July 1, 1946. Independence was the first light aircraft carrier built by the Navy and the lead in its class. Commissioned in 1943, she weighed 10,662 tons and measured 623 feet from tip to tail. She was designed to carry just 30 aircraft. Independence fought in the Philippines and Okinawa in World War II. After the war in July 1945, she was disposed of in Operation Crossroads, atomic bomb testing at the Bikini Atoll, as a target ship. However, while severely damaged in the blast, she didn’t sink. Instead, she was later hauled to San Francisco in 1951, where she was scuttled. In 2001, the San Francisco Weekly raised concerns that the still radioactive hull contributed to nuclear pollution in the area. The ship was the second U.S. light aircraft carrier, this one weighing 13,000 tons and measuring 623 feet, was commissioned in 1943. Princeton was designed to carry 45 aircraft. She fought for just over a year and a half before she was sunk at the Battle of Leyte Gulf in 1944, taking 108 men with her. USS Belleau Wood (CVL-24) commissioned in 1943. Designed to carry 24 fighters and nine torpedo planes, she was 11,000 tons and 622 feet long. She supported landings on Iwo Jima and attacks on the Japanese home islands before the end of the war. In 1953, she was loaned to the French navy under the name Bois Belleau, serving in the Algerian war before returning to the U.S. Navy in 1960. She was then sold to Boston Metals Co. for scrapping seven weeks later. USS Cowpens (CVL-25), also known as “The Mighty Moo,” was commissioned as a light aircraft carrier in 1943, weighing 11,000 tons and measuring 622 feet. In World War II she took part in the assault on the Marshall Islands and the fight for the Philippines. In May 1960 she was sold for scrap. USS Monterey (CVL-26) was commissioned in 1943, weighing 11,000 tons and measuring 622 feet. She participated in the Battle of the Philippine Sea before the end of the war. During the Korean War she spent four years as a training ship before decommissioning in 1956. She was sold for scrap in 1971. USS Langley (CVL-27) was commissioned as a light carrier in 1943, in time to participate in attacks on the Marshall Islands and Okinawa. She weighed 11,000 tons and measured 622 feet, carrying up to 45 aircraft. She was loaned to France from 1951 to 1963, then returned to the United States and sold to Boston Metals Co. for scrap metal in 1964. Commissioned in 1943, Cabot (CVL-28) weighed 11,000 tons and measured 622 feet. She participated in the Pacific campaign of World War II, then was mothballed for 12 years until she was loaned to the Spanish fleet in 1967. In 1989, she was returned and converted into a museum anchored off New Orleans. However, her caretakers fell into debt, and in 1999 she was auctioned off to Sabe Marine Salvage for scrap. USS Bataan (CVL-29) was commissioned in November 1943, weighing 11,120 tons and 622 feet long. She fought in the Pacific campaign of World War II, then saw action again in Korea in 1952. Decommissioned in 1954, she was sold for scrap seven years later to the Nicolai Joffe Corp. in Beverly Hills, Calif.
USS San Jacinto (CVL-30) Also commissioned in November 1943 was the San Jacinto (CVL-30). As another light aircraft carrier designed to carry 45 planes, she weighed 11,000 tons and was 622 feet long. She fought in the Marianas Islands and supported attacks on the Japanese home islands near the end of World War II, then was decommissioned two years after the end of the war. In 1971 she was sold to the National Metal and Steel Corp. in California for scrap metal. USS Bon Homme Richard (CV-31) was commissioned in November 1944, the Essex-class Bon Homme Richard (CV-31) weighed 27,100 tons and measured 872 feet. She joined the war in time to participate in attacks on the Japanese home islands, and afterward transported troops home from the Pacific theater. She was briefly deactivated after World War II, but called back to duty to participate in the Korean War, and fought again in Vietnam. Decommissioned in 1971, she was mothballed for 20 years before being sold and scrapped by Southwest Marine Recycling. USS Leyte (CV-32) had just missed the end of World War II when she was commissioned in April 1946, but saw action later in Korea. An Essex-class carrier, she weighed 27,100 tons and measured 872 feet, and was built for 90 to 100 aircraft. She was decommissioned in 1959 and sold for scrap in 1970. 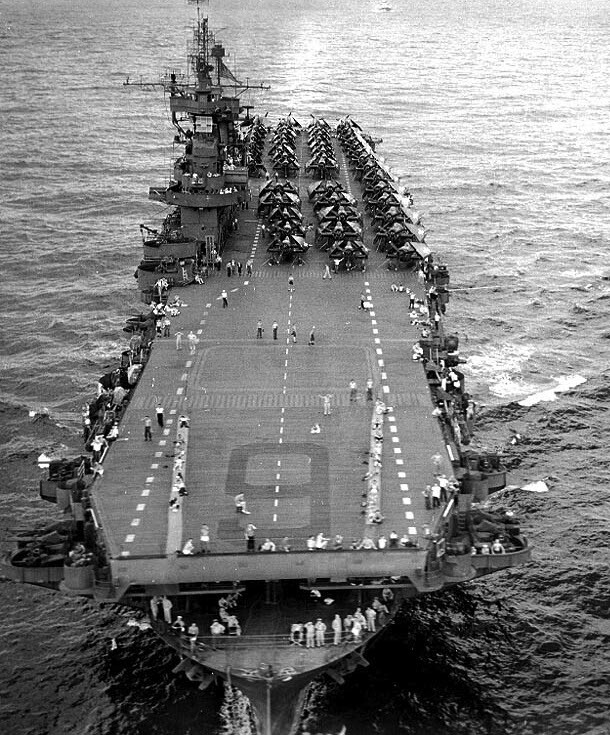 USS Kearsarge (CV-33) was commissioned in March 1946, weighing 27,100 tons and 872 feet in length. She was built to hold 90 to 100 aircraft. Though she missed the end of World War II, Kearsarge served in the Korean War and Vietnam. She was decommissioned in 1970. Four years later she was sold for scrap metal. The was the last of the Essex carriers commissioned, having started construction in World War II but only joining the fleet in 1950. She underwent extensive modernization while still under construction, ending up at 30,800 tons and 904 feet long, though still built for just 90 to 100 planes like the rest of the Essex class. She supported the amphibious assault on Inchon in the Korean War and later launched bombing missions over Vietnam. Decommissioned in 1976, Oriskany was subject to a variety of aborted plans, including reactivation (which failed because of the poor material condition of the ship), inclusion in a “City of America” exhibit in Tokyo Bay (for which financing collapsed), and a contract for scrapping (which was canceled for lack of progress). Still floating in 1999, she was used for the set of the Robin Williams film What Dreams May Come. Finally, in 2004, the Navy gave Oriskany to Florida, which sank her for use as an artificial reef. In 2007, The Times of London listed her as one of the best shipwrecks for scuba-divers in the world. Reprisal (CV-35) was doomed before she was born. Started during World War II, the 27,100-ton, 872-foot carrier was canceled in August 1945 when she was half-finished. She was sold to Boston Metals Corp. for scrap in 1949. USS Antietam (CV-36) was commissioned in January 1945, weighing 27,100 tons and 888 feet long. As an Essex-class carrier, she was built to carry 90 to 100 planes. In 1951 and 1952 she launched sorties over Korea. Decommissioned in 1963, she was sold to Union Minerals and Alloys Corp. for scrapping in 1974. Commissioned in November 1945, Princeton (CV-37) was 27,100 tons and 888 feet, and ready to carry 90 to 100 aircraft. 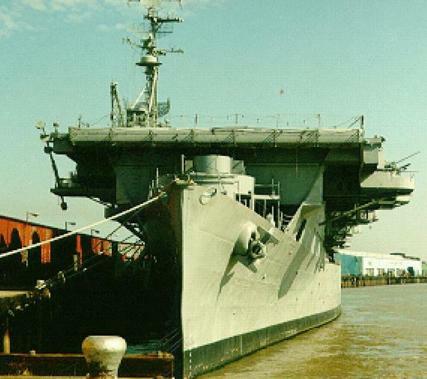 While too late for World War II and thus deactivated, she was recommissioned in 1950 for the Korean War, and supported operations in the Vietnam War as a converted amphibious assault carrier. She was decommissioned in 1970 and sold for scrap metal the following year. USS Shangri-La (CV-38) one of the last Essex carriers commissioned in time to fight in World War II, having been commissioned in September 1944. She weighed 27,100 tons, was 888 feet long and held 90 to 100 aircraft. After the surrender of the Japanese, the next time Shangri-La saw action was in Vietnam in 1970. Decommissioned in 1971 and kept in reserve for 11 years, the U.S. Maritime Administration plundered her for spare parts to use on the training carrier Lexington before she was sold for scrap and demolished at a yard in Taiwan. USS Lake Champlain (CV-39) was commissioned in June 1945, in time to carry troops home from World War II combat theaters. An Essex-class carrier, she weighed 27,100 tons, measured 888 feet and could hold 90 to 100 aircraft. The ship served in Korea and helped blockade Cuba during the Cuban Missile Crisis. In 1969 she was decommissioned. Three years later she was sold for scrap. USS Tarawa (CV-40) was commissioned in December 1945, weighing 27,100 tons, 888 feet long and designed to carry 90 to 100 planes. Four years later she was decommissioned, but resurrected for the Korean war the following year. However, Tarawa never fought in Korea, participating instead in high-altitude nuclear tests before being re-decommissioned in 1961. In 1961 she was sold to Boston Metals Corp., which tore her down for scrap at a yard in Baltimore. The ship was the lead in a new class of larger carriers. When commissioned in September 1945 she weighed 45,000 tons—though she put on another 21,000 pounds before decommissioning—was 972 feet long and could theoretically carry 137 planes, though in reality the Navy learned she couldn’t coordinate operations for that many. Most of the action she saw was in Vietnam, where she laid mines around North Vietnamese ports and later evacuated refugees as South Vietnam collapsed. She also played a part in Operation Desert Storm. She was decommissioned in 1992. Eleven years later, work began to turn the Midway into a museum. In 2004 she opened as a museum at the Navy Pier in San Diego. Commissioned in October 1945, Roosevelt weighed 45,000 tons and measured 968 feet in length. She was designed to hold 137 planes. 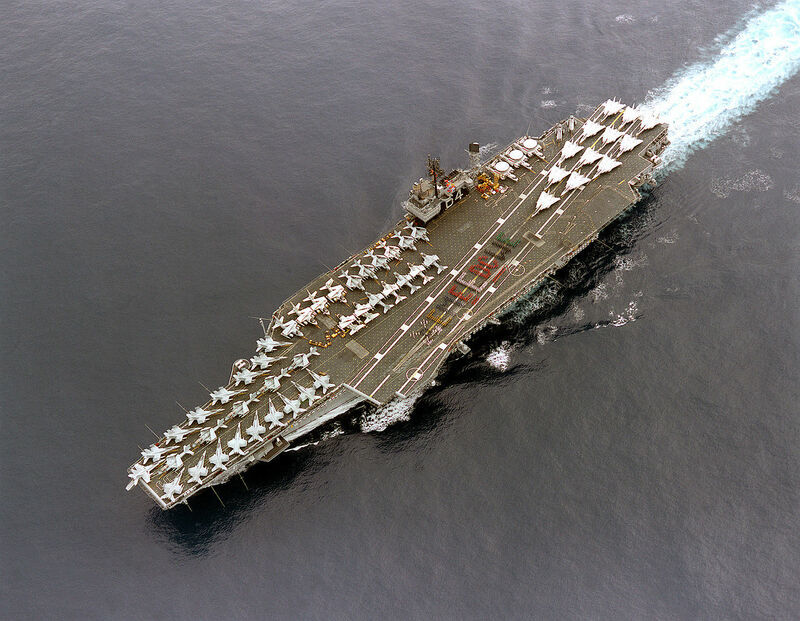 Unlike other carriers in the Midway class, Franklin Roosevelt was never fully upgraded, and instead was decommissioned in 1977 due to its poor material condition. In 1978 she was sold to the River Terminal Development Co. for $2.1 million. After the ship was raided for usable equipment, she was scrapped at a yard in New Jersey. The ship was commissioned in 1947 as a large aircraft carrier of the Midway class, weighing 45,000 tons and 968 feet long. She could carry up to 130 planes. From 1965 to 1975 she performed repeated combat tours around Vietnam, and in 1979 she participated in a disastrous attempt to rescue hostages held at the U.S. Embassy in Iran. Decommissioned in 1990, Coral Sea was sold to Seawitch Salvage in Baltimore three years later. The ship was commissioned in November 1946. The last Essex-class carrier to join the fleet, she weighed 27,100 tons and measured 888 feet in length, with a capacity for 90 to 100 aircraft. She launched the first bombing strike of the Korean War in 1950 and deployed there repeatedly through 1952, and also performed combat deployments during the Vietnam War. Valley Forge was slated to become a museum after she was decommissioned in 1970, but funding fell through, and she was sold to Nicolae Joffre Corp. for scrapping instead in 1971. In the meantime, however, she was used as a filming location for the science-fiction film Silent Running. USS Iwo Jima (CV-46) never made she out of the harbor. Ordered in 1943, she was canceled while under construction. What there was of the ship was scrapped in 1946. USS Philippine Sea (CV-47) was commissioned in May 1946 as a long-hulled Essex-class carrier, weighing 27,100 tons and 888 feet long. In 1950 she was called to duty for the Korean War, deploying twice to that theater of operations. Philippine Sea was decommissioned in 1958 and sold to Zidell Explorations Corp. for scrap in 1971. Saipan was the lead ship in a new class of light carriers. Commissioned in July 1946, the Saipan was 14,500 tons, 684 feet long and designed to carry approximately 50 aircraft. She hosted the first carrier-based jet squadron, which consisted of FH-1 Phantoms. In 1966 Saipan was converted from a carrier to a Major Communications Relay Ship and renamed the Arlington. She performed combat tours of Vietnam in 1967 and 1968 and helped recover astronauts from NASA’s space flights. Decommissioned in 1969, the vessel was sold for scrap 10 years later. USS Wright (CVL-49) was the second in the Saipan class, weighing 14,500 tons, 684 feet long, and built for about 50 aircraft. Commissioned in February 1947, she was converted to a command ship in 1963 but retained her original name. She was decommissioned in 1970 and sold for scrap in 1980. Six Essex-class carriers with hull numbers CV-50 through CV-55 were ordered 1944, but all were canceled before construction started. 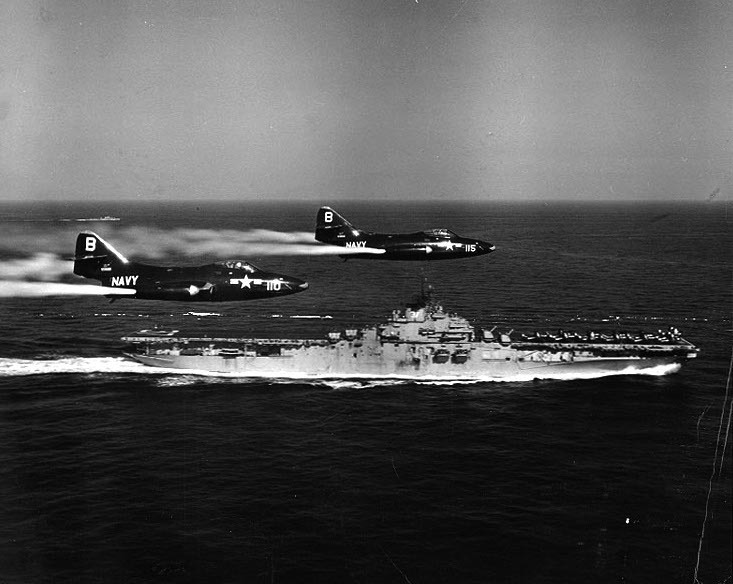 The Midway-class carriers CV-56 and CV-57 were also canceled before their keels had been laid. CV-58, the lead ship in a new class—tentatively to be named the United States, was likewise canceled, but only five days after the keel was finished in 1949. The ship was commissioned in 1955, inaugurated a new line of so-called “supercarriers,” weighing 60,000 tons and 990 feet in length. She was built to carry about 85 aircraft. She was decommissioned in 1983 and plundered for spare parts to support the rest of the carrier fleet. The Navy offered what remained for donation as a museum and a foundation took up the cause, but failed to raise enough funds for the project. The Navy then considered donating Forrestal to a state to sink as an artificial reef, but that idea fell through as well. In 2013, Naval Sea Systems Command announced that it plans to pay All Star Metals one cent to tow and scrap the ship. All Star Metals will receive the profits from metal it salvages and sells. It was towed away in February of this year. 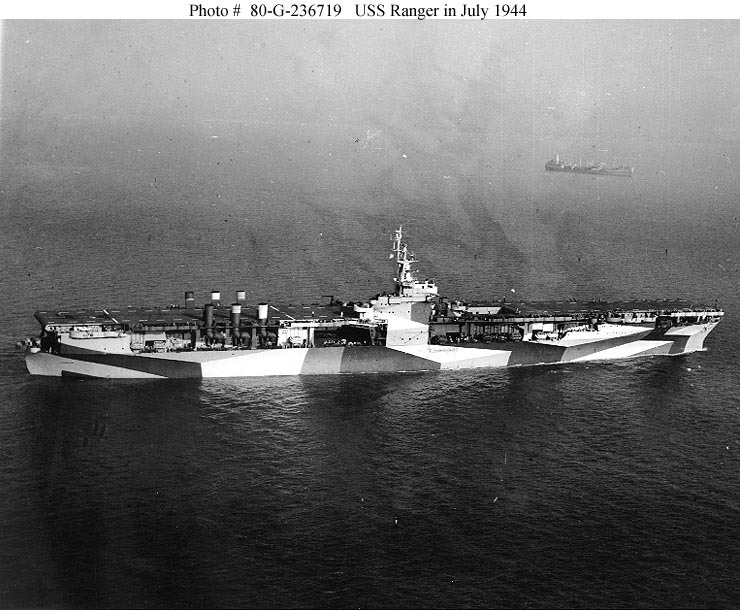 Ranger was the third Forestal-class super carrier. 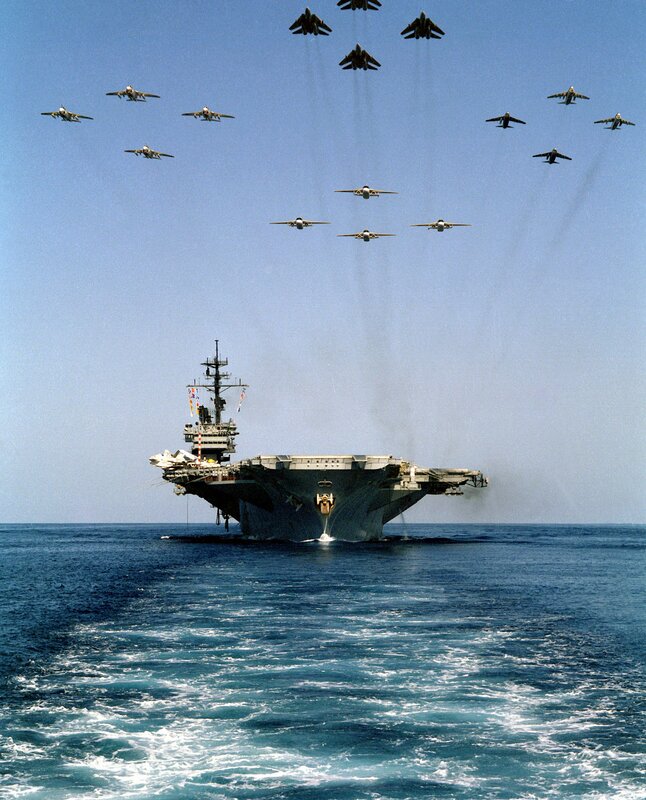 Commissioned in 1957, the ship served extensively in the Vietnam War and through Operation Desert Storm. The ship was decommissioned in 1993 and sent to the Naval Inactive Ship Maintenance Facility in Bremerton, Wash. A 2012 bid to turn Ranger into a museum ship on the Columbia River near Fairview, Ore. failed. The ship will likely be scrapped. USS Independence (CV-62) in mothballs. 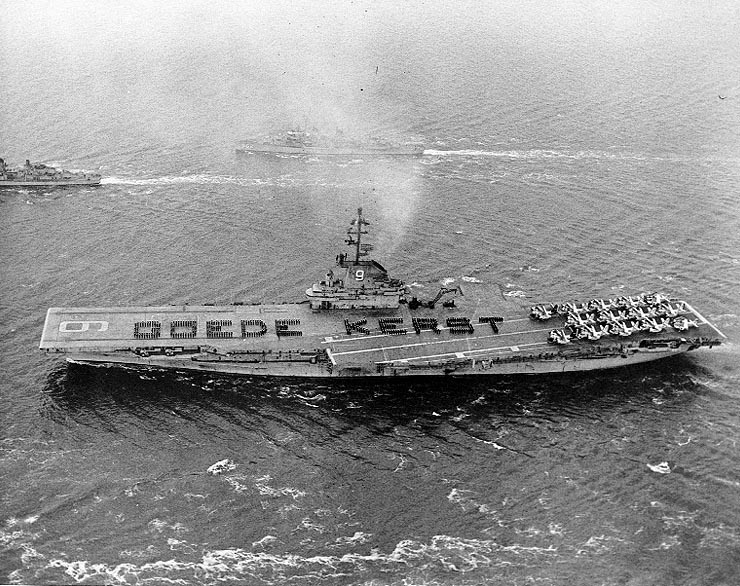 Commissioned in 1959, Independence was the final Forestal-class carrier. The ship was decommissioned in 1998. It’s currently at the Naval Inactive Ship Maintenance Facility in Bremerton, Wash.
Named for the North Carolina site of the first powered flight, Kitty Hawk commissioned in 1961. The 83,000-ton carrier served in Vietnam War and was the forward deployed U.S. carrier in Japan from 1998 to 2008. The ship was decommissioned in 2009. 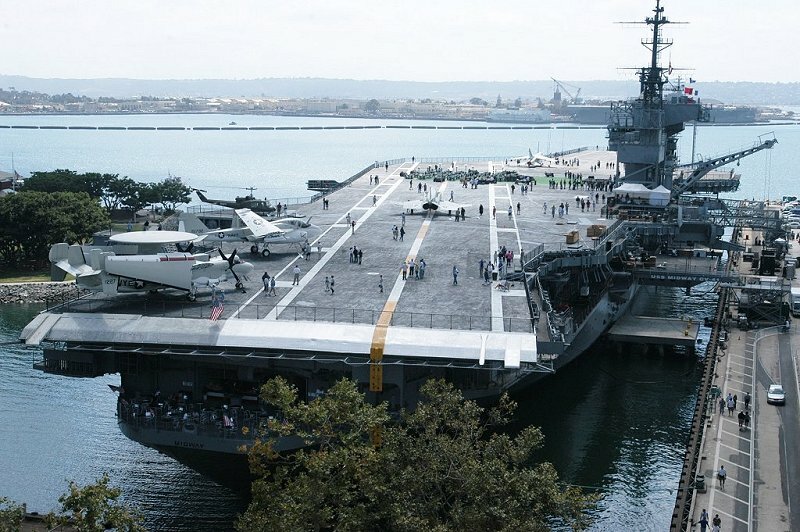 Kitty Hawk is currently Naval Inactive Ship Maintenance Facility in Bremerton, Wash. Groups in North Carolina and Florida have made bids to turn the ship into a museum. The first U.S. nuclear carrier, Enterprise was commissioned in 1961 and was in service for more than 50 years. It’s being defuled and disassembled in Newport News, Va. The ship was commissioned in 1965. As a Kitty Hawk-class carrier, she was 62,154 tons and 990 feet long, and designed to carry 79 aircraft. She performed three combat tours of duty in Vietnam and participated in peacekeeping and evacuation missions in the Middle East and North Africa, as well as supporting Operations Desert Shield and Desert Storm. While America was originally slated for a service-life extension program, because of budget cuts she was decommissioned instead in 1996. Plans to have it sold for scrap were canceled in favor of using the hull as a target in live-fire underwater explosive tests. In 2005 she was scuttled near Cape Hatteras off the North Carolina coast. 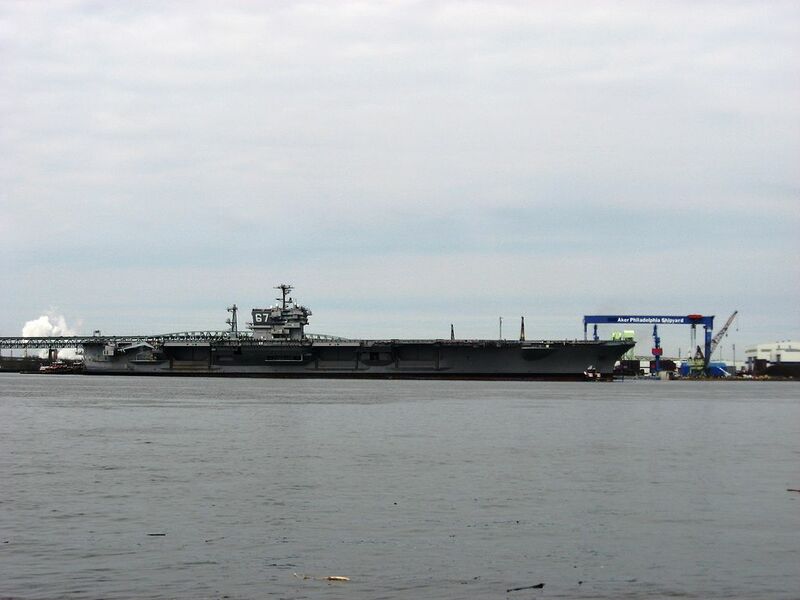 USS John F. Kennedy (CV-67) towed to Philadelphia in 2008. Photo via Wikipedia. John F. Kennedy was commissioned in 1968. It’s the last conventionally powered carrier the U.S. Navy builds ahead of the Nimitz-class of nuclear carriers. The ship spent most of the 1970s in the Atlantic and the Mediterranean and responded to the Marine Barracks bombing in Beirut, Lebanon in 1983. The ship also fought during Operation Desert Storm. The ship was decommissioned in 2007. The ship is currently part of the Philadelphia reserve fleet. Cid Standifer is a freelance reporter, web designer and translator. She has written for Stars and Stripes, Military Times, Inside Washington Publishers and the Roswell Daily Record.